ZIVELO makes something for all applications. ZIVELO, a recognized leader within the self-service kiosk and digital signage manufacturing industry and BlueFocus Media, an innovative developer of digital networking solutions announced today their partnership agreement. This agreement grants BlueFocus Media direct access to ZIVELO’s complete line of products. BlueFocus Media turned to ZIVELO to integrate their successful TAP (Tourist Assistance Portal) platform with the kiosk manufacturer’s industry-proven designs to offer a complete turnkey solution to their clients. TAP (Tourist Assistance Portal) is an interactive touchscreen kiosk which is placed in high traffic tourist locations such as a visitor’s bureau and acts as a virtual tour guide and public information hub. Offering easy access to local history, culture and events, weather forecasts, and current local business guides--complete with maps, menus, and photo galleries--the TAP system is a valuable tool for any community that wishes to generate revenue and a positive perception of their area. BlueFocus Media is based in Savannah, Georgia, where the very first TAP system was rolled out in 2009. TAP is an interactive information system that uses a touch-screen interface and is an eco-friendly way to provide tourists with easy access to local accommodations, dining, shopping, events, weather, culture and events. Since its inception, the TAP network has expanded to assist visitors to several U.S. cities, and has plans to expand to several more within the year. For more information about BlueFocus Media, please visit http://www.bluefocusmedia.com or contact info(at)blufocusmedia(dot)com. ZIVELO has rapidly grown to become the world’s largest self-service kiosk manufacturers, with over 250,000 square feet of manufacturing facilities and over 200 employees. The design, engineering, and manufacturing of their public terminal systems are completely contained within the United States, allowing them to offer rapid turnaround of product delivery. ZIVELO’s product line is well known globally and with over 50 resellers and distributors throughout the US, Canada, Europe, South Africa and Australia has been utilized by customers across multiple industries such as Coca-Cola, Nike, Verizon, Hilton, US Steel, CIA, FBI, Siemens, Boeing, MIT, NASA and the US Army. 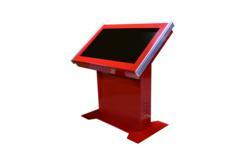 For more information about ZIVELO or its line of kiosks and digital signage, please visit http://www.zivelo.com or contact info(at)zivelo(dot)com.